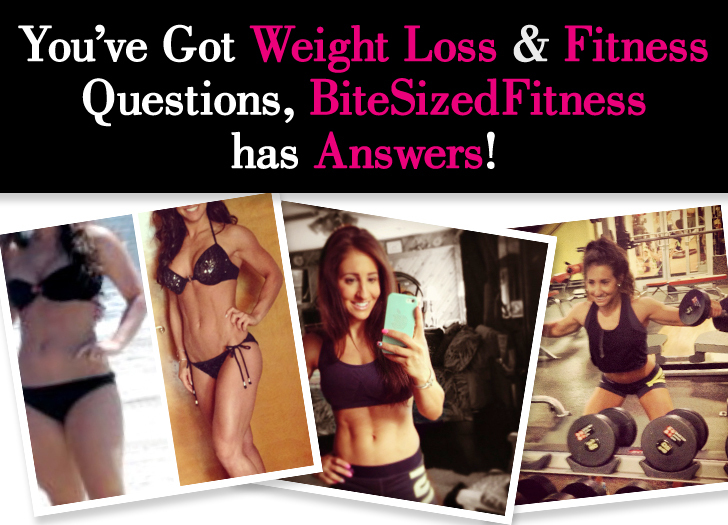 You’ve Got Weight Loss & Fitness Questions, BiteSizedFitness has Answers! There’s nothing easy about losing weight. Even finding answers to your questions can seem like an impossible challenge, especially with so much conflicting information out there. That’s why I’m providing solutions to your most common weight loss questions. From what to eat to how much to exercise to how to stay motivated and resist temptation, keep reading for simple solutions that will have you bikini-ready by summer! How often do I need to exercise in order to see results? There isn’t a magic number for how much or how little a person needs to workout. Many health organizations recommend that adults complete at least 30 minutes of moderate intensity exercise five times a week. However, if you’re looking to shed pounds and transform your body, you will need to dedicate more time towards physical activity. For maximum results, I’d suggest increasing the intensity and variety of your workouts. As a working student, I know that it is not always easy to make time for the gym. All you need is a few hours each week for physical activity in order to lose fat and build muscle. It’s not necessary to do double sessions or two hour-long workouts unless you are training for a competition or race. Additionally, overworking your body can place you at risk for injuries and halt your progress for weeks or months. 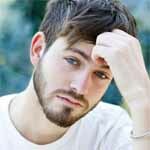 What strategy can I use to resist eating unhealthy foods? The best advice anyone ever gave me was to make yourself accountable for what you eat. If you want to stuff the entire pizza or the batch of chocolate chip cookies down your throat, then it needs to be a conscious decision. People eat for all different reasons, and it’s not always due to hunger. To increase awareness of when, what, and how much you’re eating, take a picture of your meal or write it down in a journal. 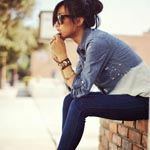 This allows you to identify areas for improvement, as well as situations that trigger bad decisions, like boredom or starvation. Another way to resist unhealthy foods is to think about your satisfaction a few hours later. If you eat that 2-day-old brownie in the office lunchroom (which is probably about 300 calories and loaded with sugar and trans fats) will your sweet tooth be satisfied? Sure, a handful of M&Ms might bring you a few seconds of joy, but you won’t enjoy the hour of cardio it takes to burn them off after work. How do I get the body of my dreams? As Randy Pausch once said, “A lot of people want a shortcut. I find the best shortcut is the long way, which is basically two words: work hard.” There is no substitute for dedication and determination… and a healthy diet and exercise. Unless you were born with the genes of a supermodel, you are going to have to work for the body of your dreams. Try to create a routine that is both maintainable and enjoyable (or at least not restrictive and miserable). If you want to look your best year-round then you need to have a diet and exercise plan that won’t have you hating life after a few weeks. This is exactly why I still eat some form of chocolate each day! And while I try to eat healthy 80% of the time, the best bodies are made from consistency, not perfection. What are some ways to stay motivated while trying to lose weight? One thing I wish I had done before starting my weight loss transformation was to take a “before” picture of myself. Although this can seem mortifying, the picture itself can serve as a source of motivation. Why do I always lose weight and then gain it all back? Usually the answer is fad diets or extreme, unsustainable lifestyle changes. We are not machines or super heroes. We are human beings, and therefore aren’t always going to eat perfectly healthy. Next time someone suggests you cut out all carbohydrates from your diet or only drink smoothies, think about the practicality and long-term effects. I believe education is the easiest way to stop the vicious cycle of weight loss and weight gain. Do you know what four ounces of chicken looks like or that many “individual” candy bags actually contain multiple servings? As of today, start looking at the nutritional label before you buy or eat anything. You may find that your yogurt actually contains 15-20 grams of sugar, which is similar to a cookie. Remember just because the box claims a product is healthy or natural, you should still check the nutritional facts first. Want More Tips? Follow Bite Sized Fitness for Daily Meal Plans & Workout Ideas. Alyse Scaffidi is the founder of Bite Sized Fitness. She is a Doctorate of Pharmacy student and knows how hard it is to make time for your health. Check out the sites below for more motivational tips, delicious recipes, and ideas for healthy eating. Meet the Author: Who is “Bite Sized Fitness”?